Match Report: Swansea City 1 – 2 Tottenham Hotspurs: Spurs took the 7th spot in the Premier League after beating Swansea City 2 – 1 at Liberty Stadium. 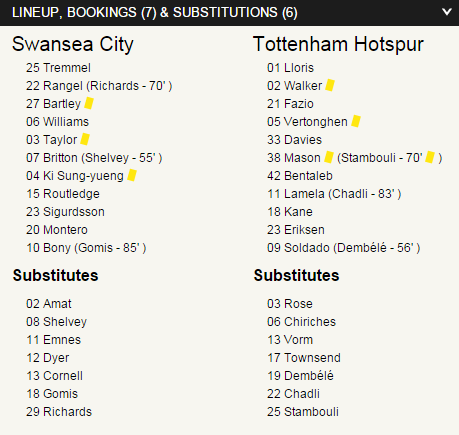 Tottenham took the 7th spot in the Premier League after beating Swansea City 2 – 1 at Liberty Stadium. Spurs youngster Harry Kane opened the scoring with a header from Christian Eriksen’s corner kick on the 3rd minute of the game. The first half ended with the same score line. But the Swans found the equalizer just in the two minutes of the second half when Wilfried Bony put the ball in the bottom right corner. It was his eight Premier League goal of the season. Jonjo Shelvey was introduced later than inplace of Leon Britton. While, after a minute Spurs midfielder Mousa Dembélé replaced Roberto Soldado. The game continued with 1 -1 score for almost 40 minutes. Two minutes away from the final whistle, midfielder Eriksen scored a goal from the centre of the box to give the three vital points to the visitors. 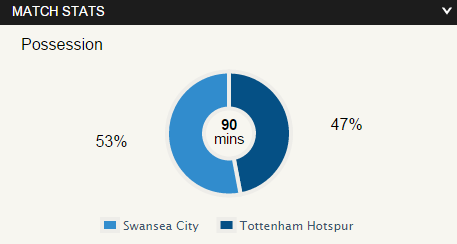 Tottenham and Swansea both gave a tough time, the home side had 15 shots, 7 corners while Spurs had 10 shots and 9 corners. The host enjoyed a little more possession as compared to the visitors . The home side are now down to ninth spot with 22 points while Spurs took the 7th seat in the Premier League. Spurs are now four points behind the fourth spot.